Crystal was born and raised in a small town in Southeast Kansas. Being the oldest of 7 siblings and living on a farm drove her passion for the outdoors. Several days were spent playing in the back of the corn truck, playing in the creeks while dad farmed, riding horses to town to visit Grandma, and hunting with her Mother. She couldn't think of a better way to grow up! Over this time she developed a love for the land and lasting memories of the "good ol' days". Graduating with a Bachelors Degree in Nursing from Fort Hays State University, Crystal pursued her dreams of being a nurse at the local hospital and loves giving back to the community in ways she never imagined. Crystal believes that the only thing better than being a nurse is having a family. Crystal is very happily married and has 3 wonderful children. 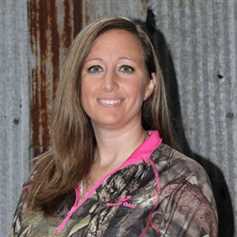 Her Husband works beside her as an Mossy Oak Properties Real Estate agent as well. Together they bring years of knowledge to the table regarding property in Southeast Kansas.